There are two ways you can enter customer invoices in Pandle. If you create the customer invoices yourself in Microsoft Word or through other similar software, you will then need to manually enter them into Pandle. However, you can also create and send invoices from within Pandle itself. This also allows you to set up payment reminders and automatically send recurring invoices to your customers. 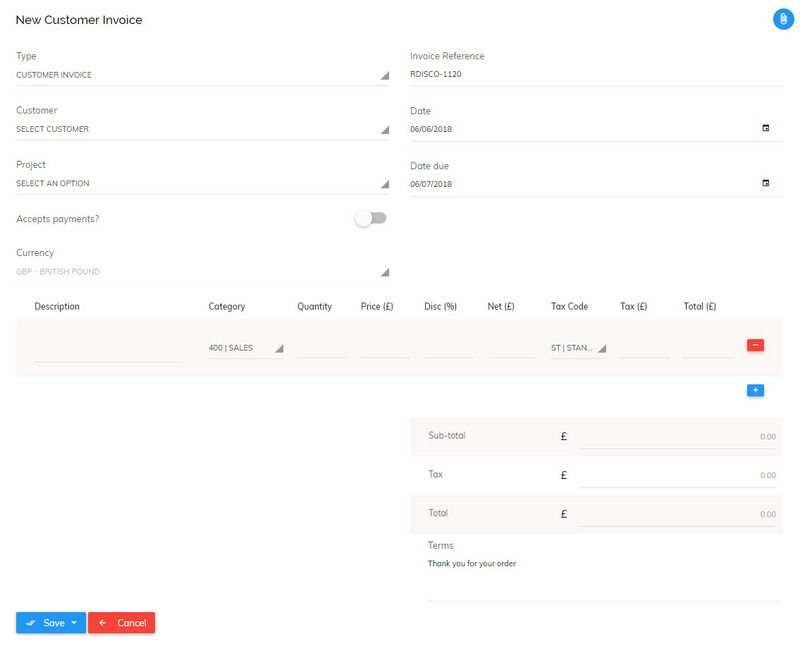 For each one you should enter the date on the invoice, select the customer you issued it to (you should add the customer if they are not on the list), the appropriate sales account (if you have more than one), the reference on the invoice (usually the invoice number) and the net amount (amount before VAT is added). ST: This is standard VAT which will be used in most cases. This is automatically set at the current rate of 20% but can be edited if some of the services/products you provide need to be entered at the reduced rate of 5%. EX: This covers services/products you provide that are exempt from VAT or zero-rated. Examples of exempt sales are insurance and education. Examples of zero-rated sales are food and books. It's always best to ensure your invoice settings are set correctly before raising any invoices. Invoice Referencing: This setting allows you to enter the invoice reference prefix and starting number. You can also include a customer reference unique to your customer when adding or editing customers. So, for example, you could have your starting invoice reference as '101' or 'CompanyRef-101' or even 'CompanyRef-CustomerRef-101'. Automated Reminders: You should tick this box if you would like Pandle to automatically send email reminders to customers who do not pay you on time. Once selected you will be presented with the option to set up your reminders, including the frequency and the content of the emails. Invoice Text: There is a box for 'Default Invoice Text' which you can use to enter any text you would like at the bottom of your invoice. For example, you may want to add a note thanking customers or suppliers for their business, or add in your payment information or invoice terms such as 'Payment due 30 days from the date of this invoice'. 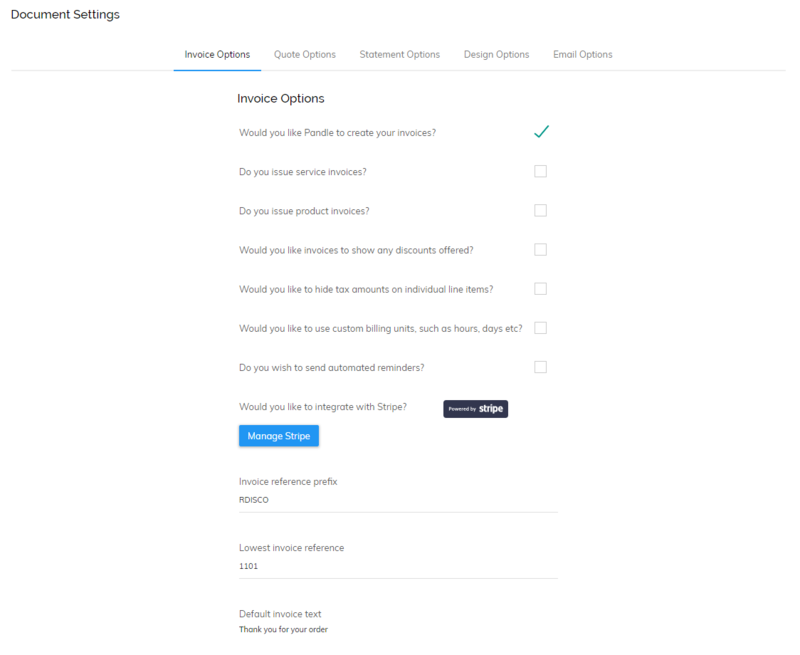 Invoice Template: If you're using Pandle Pro you also have the option to choose between various templates for your invoices. Simply click on the Design Options tab and select the invoice you prefer most. 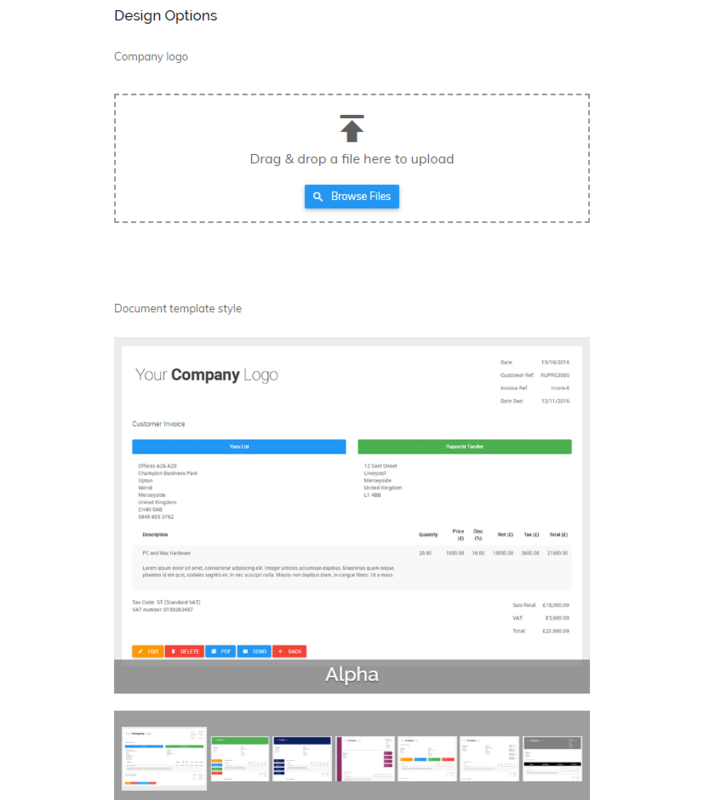 You can also upload your company logo here to appear on your invoices when you create them. You will then be asked for key information so Pandle can prepare your invoice. Here you'll need to input the customer (you can add a new one from here if they are not on the list), the category (usually sales), the description for the invoice and the price. You can add further rows by clicking on the blue '+' button. Save and Next: This will allow you to save the invoice and enter another one straight away. Save and View: This will present you with a preview of the invoice. From here you can then edit, delete, convert to PDF or send the invoice to your customer. Save and Finish: This will save your invoice and take you back to the Customers screen. Save and Recur: If you know you will regularly invoice this customer for the same amount then you can select this option which will allow you to automate future invoices to save time. Once your invoice has been created you can return to the Customers screen to see the increased amount the customer owes to you. You can view all previously created invoices under 'View'. This allows you to drill down into each invoice to see an audit trail and much more. When customers pay your invoices, you can apply those payments to the appropriate invoices when you process your banking transactions in the Banking tab. Payment reminders, recurring invoices and payment collections via Pandle Pay are also available.